The Delaware Soccer Club is delighted to announce that the club will continue to offer the PEC Zwolle Soccer Camps for Travel and Premier players age 8 - 14. The camp dates for 2017 are set for Monday July 31 through Friday August 4. The camps runs daily from 9.30a.m. through 3.30p.m. The camp takes place at the wonderful soccer facility of the Nichols School in Buffalo. What makes the camp so unique is that Academy coaches of Dutch Eredivisie club PEC Zwolle will conduct all training sessions. In 2016, the staff consisted of PEC Zwolle U11 coaches Dennis Rosink and Juryan Zandvliet, U12 coach Jacco van Olst, and U13 coach Stefan Luchtenberg. The PEC Zwolle Academy was recently awarded a Four Star rating by the KNVB, the Royal Dutch Soccer Association. This rating brings the club at par with the famous Dutch youth soccer academies of Ajax Amsterdam, PSV Eindhoven and Feyenoord Rotterdam. 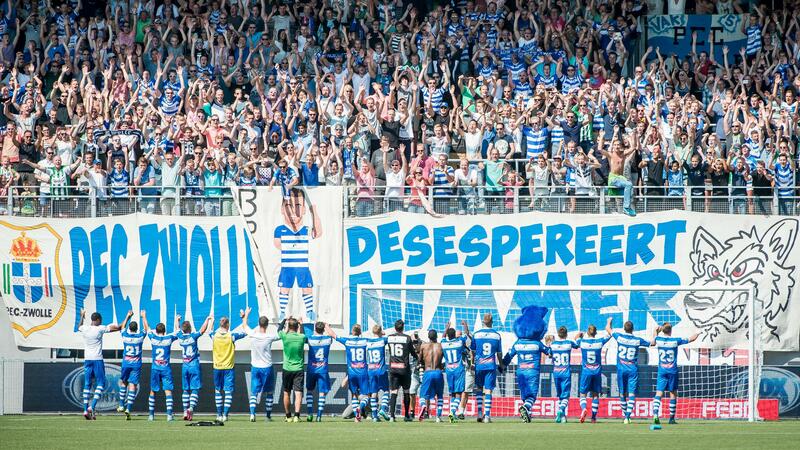 Since their return to the Eredivisie at the end of the 2011-2012 season, PEC Zwolle has become a mainstay in the top half of the Dutch premier league. The club is widely praised for their influx of homegrown players into their first team and their attacking style of soccer, based on ball possession and excellent technical skills. Especially the 5-1 throbbing of Ajax in the 2014 FA Cup final is worth watching on youtube. The PEC Zwolle camps will be based on the PEC Zwolle and Dutch soccer philosophy, which is world famous for the great players it has developed over the past four decades; Cruyff, Gullit, Van Basten, Rijkaard, Bergkamp, Van Nistelrooy, Kluivert, Robben, Van Persie and Sneijder to name a few. During the camp, players and coaches will focus on individual skills (First Touch / Receiving, Passing, Moves, Dribbling, Shooting, Finishing) and age appropriate team tactical skills such as possession play in the build up, create and finish scoring chances and defending and interrupting the build up of the opponent. All these skills will be trained in small sided games; 1v1, 2v1, 2v2, 3v2, 3v3, 4v3, 4v4, 6v6 and 7v7. Of course HAVING FUN, is also a very important goal of this camp. All players will receive the DSC - PEC Zwolle Camp Package, which includes a ball, jersey, and a bag. Registration for the PEC Zwolle Camps is now open. Please CLICK HERE to go to the registration page.